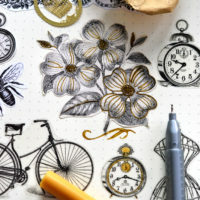 Today I am sharing a free printable I created using some lovely vintage images from the Graphics Fairy. I have been working on a huge range of Mother’s Day ‘Queen for a Day’ printables and I have created a free set of four printable wine bottle labels for Graphics Fairy fans! 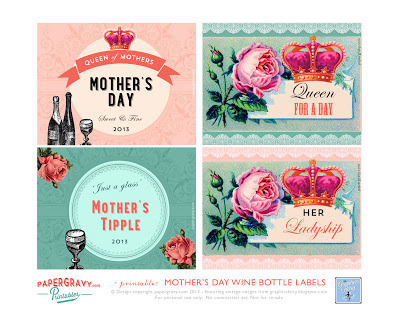 You can create your own Mother’s Day Wine labels at home very easily, simply print off on letter sized /A4 paper, cut each one out and stick onto your chosen bottle using double sided tape or glue. You can see the rest of the range at my etsy shop! 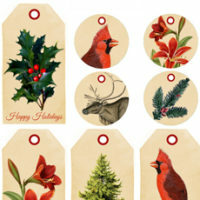 11 Free Holiday Printables! 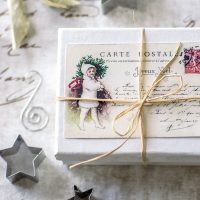 Vintage French Christmas Postcards – free printable! How to make Stickers + free printable! It was great meeting you too Jamie!! You are so sweet and fun!! These are wonderful, Karen! Thank you so much! Thank you, Karen, for sharing! Love these! Such a fun idea! Thanks for sharing these! These are simply gorgeous, thanks for sharing!